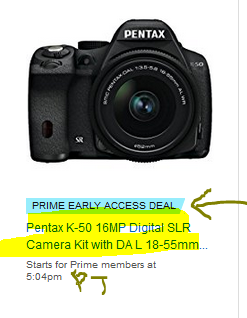 Starting at 8:04pm eastern on Thursday (5:04pm pacific time) ~ curiously the same start time as the Canon 17-40/4L on Wednesday ~ they are planning to have a lightning deal on the Pentax K-50 with 18-55mm f3.5-5.6 DA L WR. The price before the sale is $425 with Amazon itself as the seller. The Gold box link points to the black color scheme. The other two color schemes are not available. Other kits are also on the same listing. The sale price will be revealed when it goes live on Thursday at 8:04pm ET. Non-Prime members can buy it starting at 8:34pm ET.